A stainless steel bristle for this increasingly popular product. 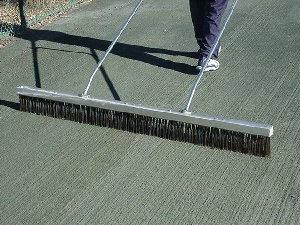 The steel bristles excel at agitating the surface of hardened indoor courts and outdoor courts with sub-surface irrigation. They also help break up algae and prevent its formation. The transition to stainless steel bristles will reduce rusting and increase this products durability. This bristles come in 12" section and can be purchased to replace bristles on existing brushes.